It’s time we have a fruitluck in north-central Florida! I’ve been so impressed by the fruitlucks in Tampa, Florida that I decided to start an event like that closer to home. So we’re having one in Gainesville, FL on Sunday, August 12, from 11AM to 2PM, at Northeast Park (see end of post for exact address and directions to what part of the park we’ll be gathering at). What’s a fruitluck? It’s simply a potluck where everyone brings fruit. Any fruit. Grown in your yard, purchased from local farmers, foraged from the wild, or purchased at the store from faraway locations – it’s an opportunity for us all to share some of the diversity of what the fruit world has to offer, while sharing good conversation with other fruit-lovers. The main focus here is just plain fruit, whole & unprocessed, but if you want to make a fruit-based concoction, that’s great too (this is a vegan-friendly event, so make sure not to include any animal product ingredients, please). You can find frozen durian for sale at Asian food stores. It’s a little pricey, but one durian can supply many people with a taste of this amazing tropical fruit. These durians were at Chun Ching Market in Gainesville. Any fruit is a welcome contribution: apples, strawberries, bananas, citrus, blueberries and melons are all part of the great fruity diversity contributing to the rainbow of colors on the table at one of these events. Some of the most fun at a fruitluck comes from some of the more exotic tropical fruits that those of us in the US don’t get to experience as much: jackfruit, breadfruit, mangos, guava, and mamey have all been making appearances lately at local markets. Chun Ching Market (418 NW 8th Ave, Gainesville, FL 32601) Asian grocery store with different aisles featuring foods from different Asian countries. Lately they’ve had dragonfruit for $3/lb,( cheapest I’ve seen for this fruit), Asian pears, jujubes, fresh jackfruit, rambutan, longan, and durian both as whole frozen fruits, and durian flesh frozen in packages. Other Tropical Markets: There are numerous other groceries in Gainesville catering to people from various tropical countries: Asian, Indian, and Caribbean groceries often have great selections of fruit unavailable elsewhere locally. Whole Foods Market: (3490 SW Archer Rd, Gainesville, FL 32608) I haven’t yet made it to the new Whole Foods in Gainesville, but I heard that they have mamey and fresh jackfruit there. Publix Supermarket: Can’t leave out Publix from this list- there’s one on just about every street corner in Gainesville. They’ve got lots of basic fruit staples, and at least a few more exotic items too. Farmers Markets: There are a number of markets around town that are good places to get local produce, including fruit. Breadfruit (left center), jackfruit (right center), and many other fruits have been showing up in the produce section at Wards Supermarket lately. Remember that some fruits are sold in the firm, unripe stage, and they will take a few days to soften and ripen. Avocados and sometimes bananas are in this category, and all the mamey and cherimoya fruits I’ve seen for sale recently have been solidly firm. If you want to bring any of these to the fruitluck, remember to purchase them mid-week to give time to ripen. If they reach soft ripeness ahead of time, just stick them in the refrigerator to slow down any further ripening. Breadfruit I’ve seen has had the opposite issue, having a very short shelf-life once I purchase it, so that might be best purchased just before the event. One important thing about breadfruit – it needs to be cooked. There are barbecue grills near the picnic tables at Northeast Park. If I have time, I’m going to try to pick up some breadfruit and bring some charcoal so we can try roasting breadfruit over the coals (I’ve never had it that way, but I hear it’s really good). We’re on the tail end of the main fig season right now in North Florida. If you have access to any fig trees with ripe fruit, please harvest some to share. And it’s the start of muscadine grape season. These delicious treats, native to the Southeastern US, might be showing up at local farmers markets already, and several local farms have done you-pick muscadine harvesting in the past. An hour or two or harvesting muscadines might be a fun thing to do on your Saturday, followed by sharing the bounty at the fruitluck on Sunday. 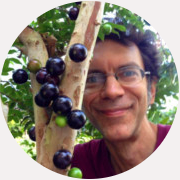 At the fruitluck, there should be some fruits from the experimental, super-rich and creamy cold-hardy avocado varieties some of us are growing in North Florida. It’s also avocado season. 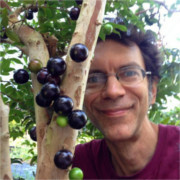 Oliver Moore says he will be bringing at least a few fruits from his cold-hardy avocado varieties, and I should be able to bring a few from my own trees. If you’ve never tasted the super-rich creaminess of these little-known forms of avocado, this is your chance to try them. If you’re not in the North Florida area and can’t attend this event, I’ve got two suggestions. If you are closer to Tampa/St Pete than to Gainesville, check out that fantastic Tampa Bay Fruitluck, which happens monthly and is the one that inspired me to create this one. If you are anywhere else in the world, start your own fruitluck! It’s a great way to meet other local fruit enthusiasts. What to bring: I am trying to bring enough supplies that everyone else needs only to bring some fruit to share. I’ve got plates, cutting board, fruit-cutting knives, a few serving platters, paper towels, hand sanitizing wipes. If you think of anything else that might come in handy, feel free to bring it. Can I bring my kids/dogs? : Yes! It’s a great opportunity to broaden your kids’ food horizons, by exposing them at a young age to lots of fruits they might not otherwise get to try. And the picnic area is directly adjacent to a children’s playground area of the park (of course, this is a public event at a public park, so as always in such situations, you should closely monitor your little ones). There is also a fenced-in dog park section of the park close by, where canines can roam free (supervised by their human friends). Location: the fruitluck is at Northeast Park. The official address of the park is 400 NE 16th Ave, Gainesville FL 32601, BUT that is the address for the north end of the park, and the fruitluck will be at the south end of the park, several minutes walk away (the picnic tables are at that south end). To get to the proper area, follow your GPS directions to the above address, but then head east on 16th Ave, take a right (southward) onto NE 6th Terrace, then another right (westward) onto NE 13th Ave. There are on-street parking spots on the right between 5th Street and 6th Street, directly adjacent to the area where we are having the fruitluck. I’ve created a Facebook Event page for this fruitluck, but right here on this page is the full info about the event. If you need to communicate with me about this event, leave a comment below, or use the contact page to message me directly. I hope to see you at the fruitluck! Sometimes I get a little worried about the land prices in South Florida. I fear that in order to have a few acres I might have to move to somewhere in Central/North Florida. I would honestly be disappointed because I love how well the really tropical fruit grows down here. I cheer myself up by trying to look at the bright side. I would be able to grow pears, peaches, figs, pomegranates, maybe kiwis, muscadine grapes, white sapote, mulberries, other berries, etc. I then find myself getting excited by the idea of being able to grow the things I can’t grow in my climate now. It is funny how the mind works. High property prices are indeed a tough challenge. But I’ve spent a few months living in Dade county, and compared to hear in North Florida, the tremendous abundance of tropical fruits down there is so much greater than the occasional episodes of fruit production we get up here in the frost country of North Florida. I’ve heard there are warm pockets in South Central Florida, where tropical fruits do fairly well. I haven’t looked into property prices there, but hopefully they’re more reasonable than in Dade.